It was often the standard joke in the US that the best things about teaching were June, July and August. Here in my part of South Africa, where families are large and less affluent, long relaxing, educational or cultural vacations are not possible. Scarce money is used to help your children with educational expenses, to put petrol in the car, buy food for the family, pay for funerals and weddings, buy clothes, buy cell phones and airtime. I feel so privileged and fortunate to have enough money to go on vacation where and when I want, above and beyond my Peace Corps stipend. In September, my cohort met in Pretoria for the medical staff to give us a cursory medical checkup, send everyone to a dentist, and then attend Mid-Service Training. For the last three nights we were at a posh resort outside of Pretoria, with lovely rooms, excellent food, pretty grounds with a reservoir. A treat for the 22 out of 24 left from my original cohort of 35. After the training, I went on a week’s holiday with Catherine and Carolyn. 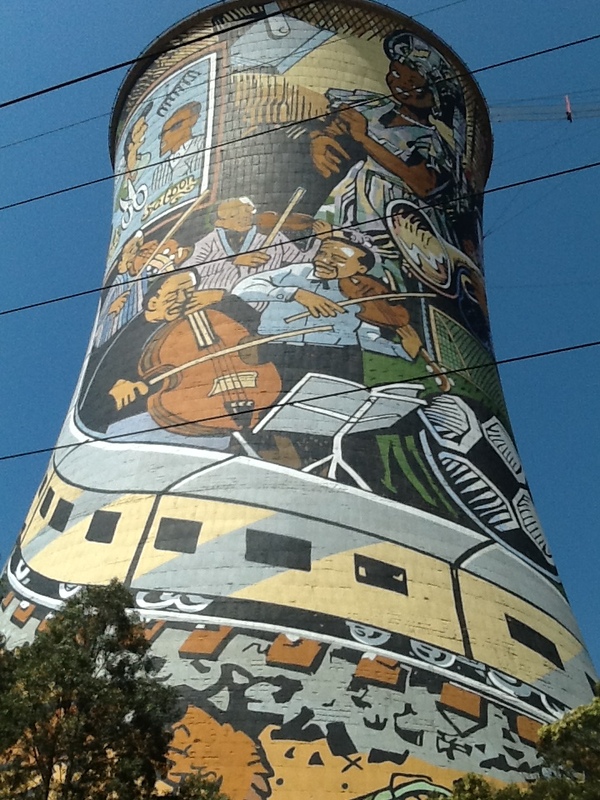 We toured Johannesburg on the hop on-hop off double decker bus (don’t bother) and toured Soweto with a private tour guide (definitely do this). 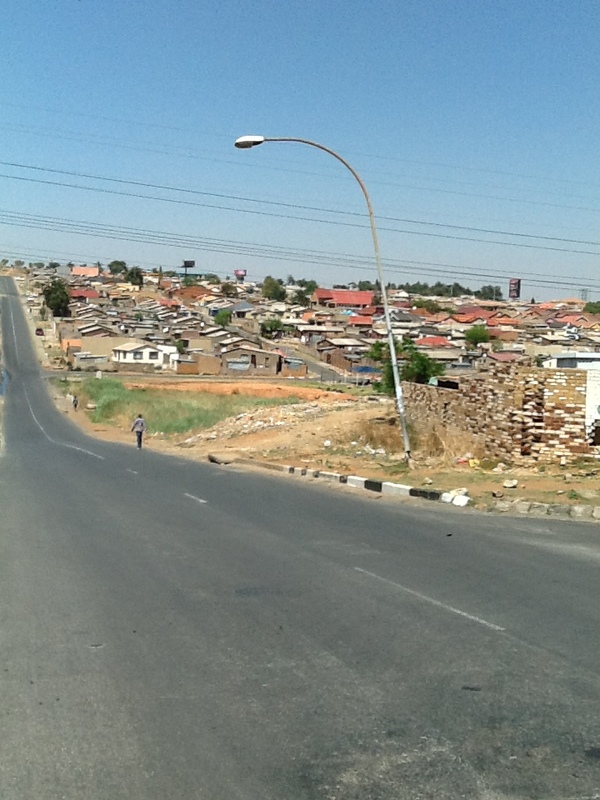 Soweto has much historical and sociological significance for South Africa. 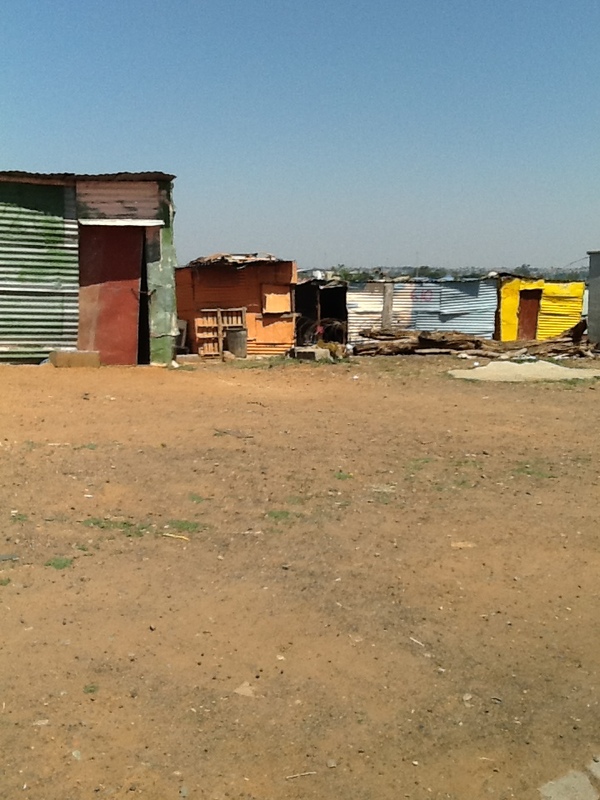 It is a huge area now with many divisions, housing both low, middle and upper class black Africans. 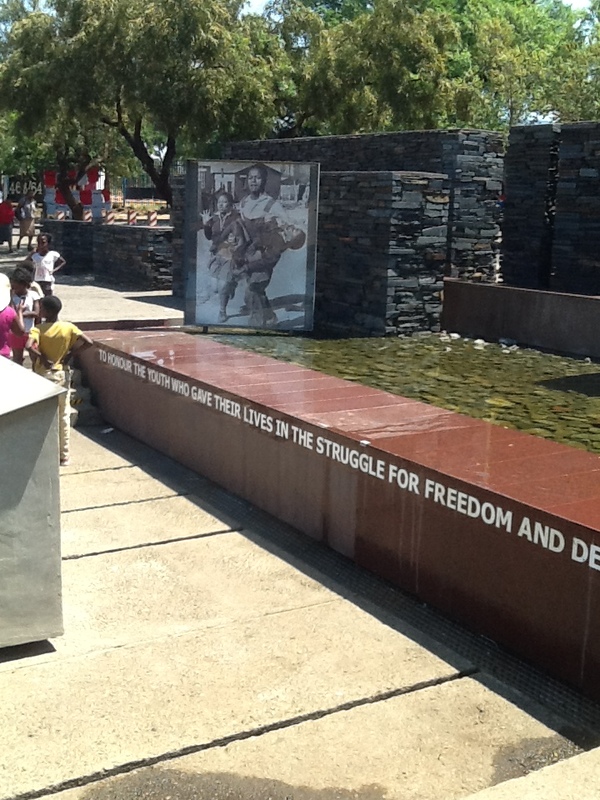 We toured the Hector Pieterson Museum and learned about the 1976 uprising of the local students who didn’t want Afrikaans to be the language of instruction in their schools. The ensuing tragedies of that protest are documented in chilling photos in the museum. It was nice to be in cities, with restaurants and running water and first world life going on all around. 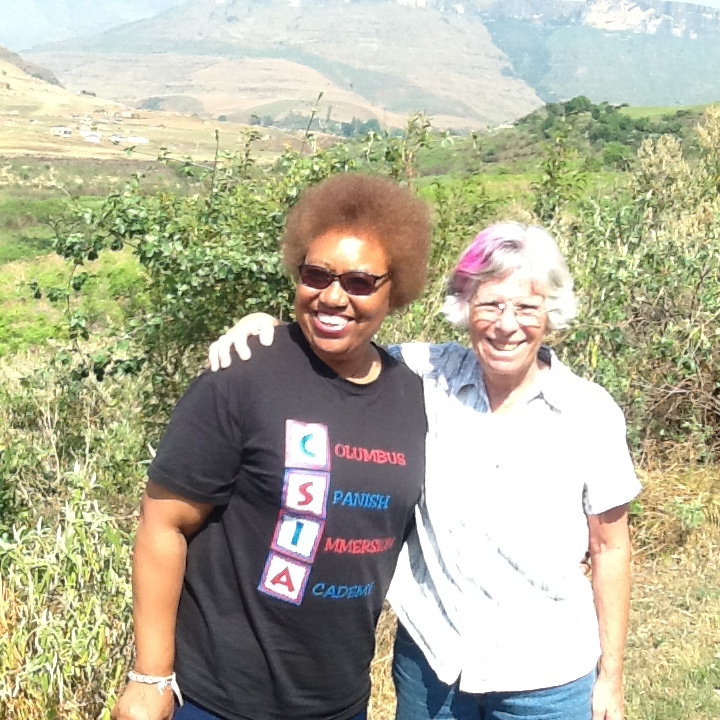 It was nice to be with my Peace Corps friends and hear their stories, share a bit of their lives. 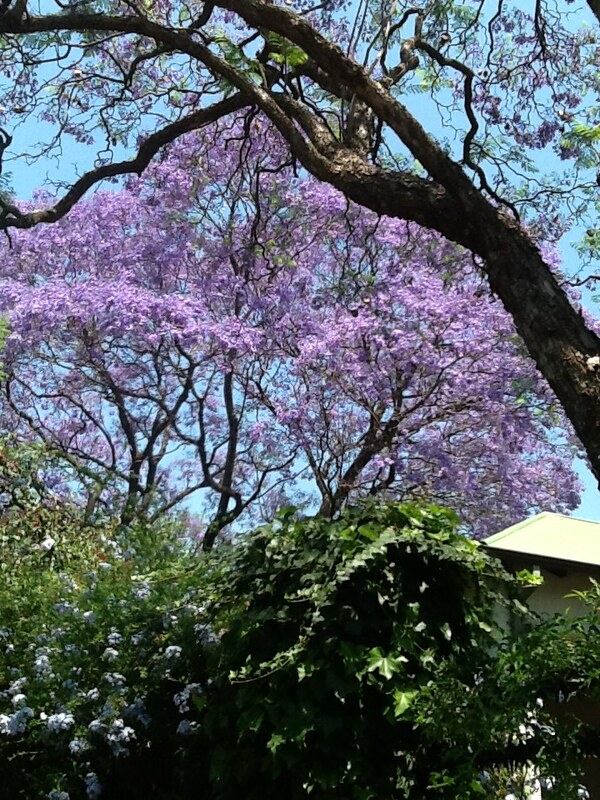 In Pretoria, the jacaranda trees were blooming everywhere making whole streets and hillsides carpets of blue flowers! 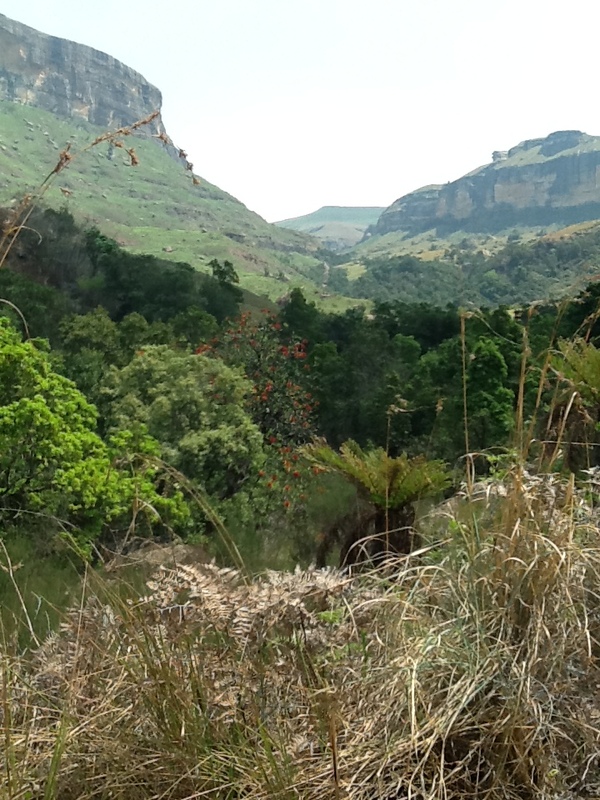 On Monday morning, the three of us collected our car (a Honda) from the rental car agency and drove south on the N3 to the Drakensberg Mountains. It took longer than anticipated and we got a little lost, but eventually we found our way to Amphitheatre Backpackers where we stayed for three nights. 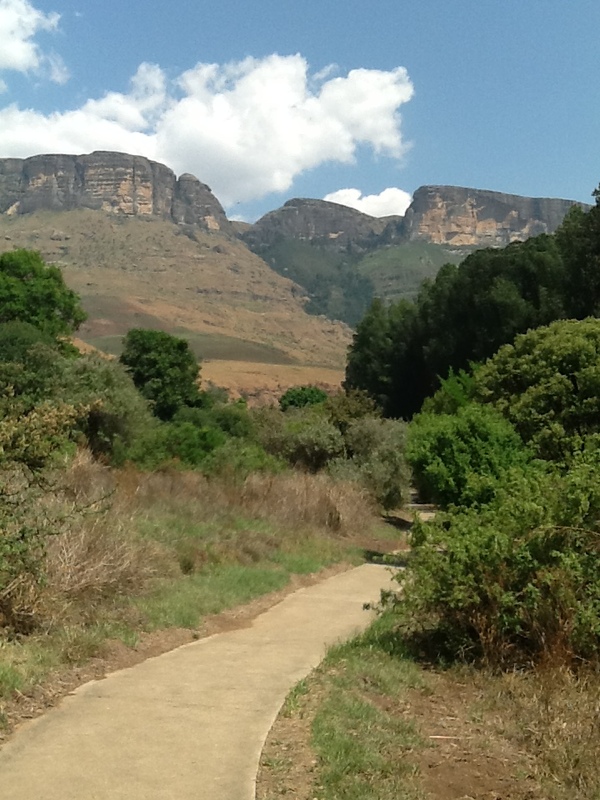 It is a lovely open area with a great view of the mountains and a half-hour drive to Royal Natal National Park. On our first day, we went to the park, hiked on the easy paved Cascades path and enjoyed being outdoors in nature with commanding views of the mountains. 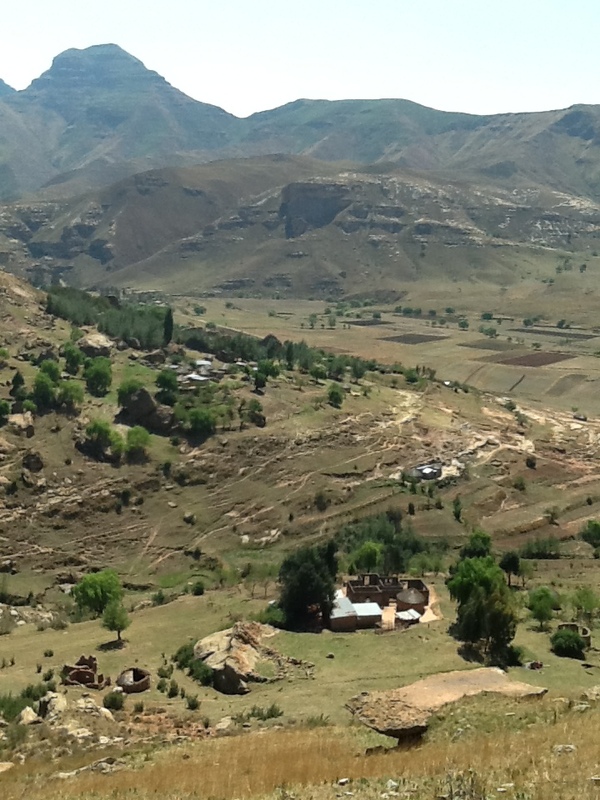 On our second day, we took a one-day tour to Lesotho, a mountain kingdom totally surrounded by South Africa. The young guide drove the taxi up gravel roads to the high pass (Monantsapas) between the two countries and then down a very steep road into Lesotho to a small village near the border. 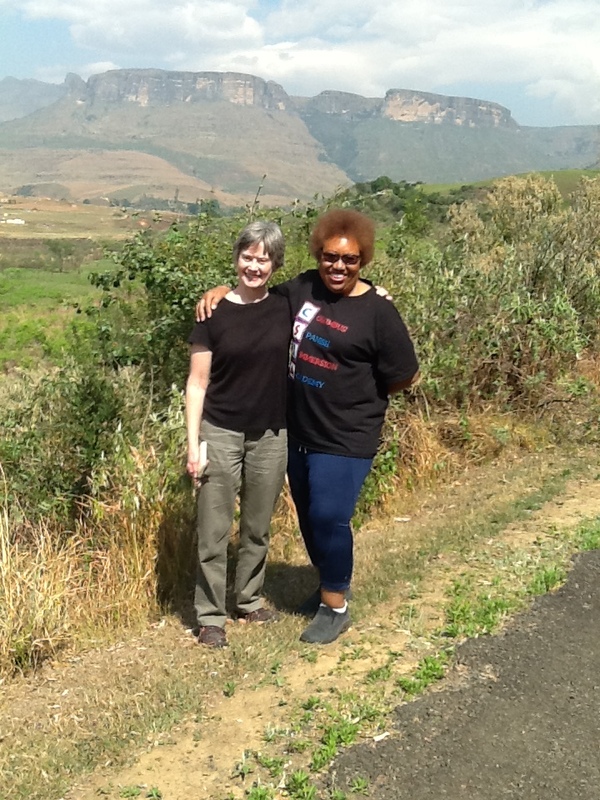 There we met students and teachers at a small primary school partially assisted by Amphitheatre Backpackers and then went on a difficult steep hike into the mountains above the village. Beautiful! After our time in the mountains, we drove to the area near Vryheid where we had lived during training (over a year ago) and visited too briefly with our host families. Mama fed us a chicken dinner, I brought them fruit, cake, and juice. And I had photos taken. 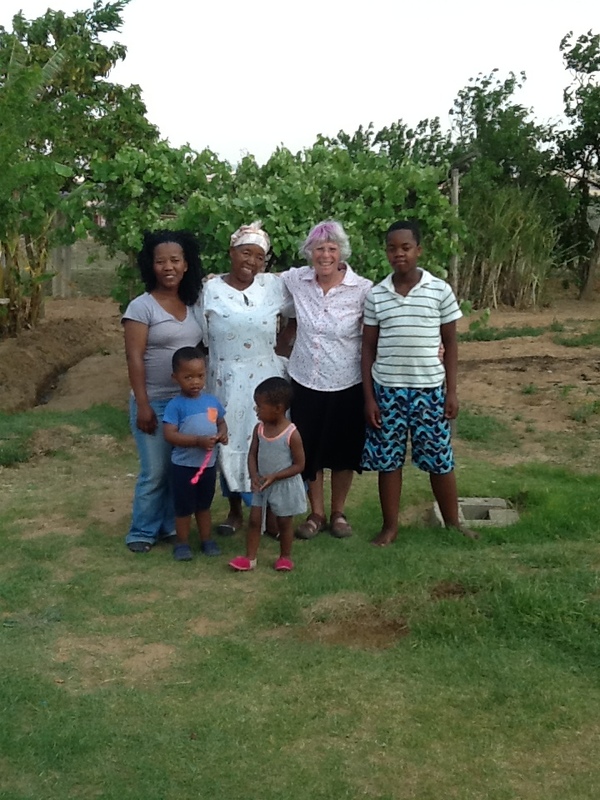 I loved seeing this warm family again and I hope I will get to see them once again before I leave South Africa. One of the things we were able to do with a car was get lots of groceries to both Catherine’s and Carolyn’s sites, something so difficult to do if you are traveling by taxi. I got to see where they were living. It is hard not to make comparisons; my house is a 100 times nicer than either of theirs. However, they are living fairly close to each other and can go on excursions into town together. Nothing’s perfect. Term 4 has now started. I didn’t go to school for the first three days of the term because I was very sick with stomach cramps. It was my usual syndrome (all my life) but worse because of nausea and dehydration. Some caring teachers from my school drove me to/from the doctor in Jozini and I was soon better and back at school for teaching on Thursday and Friday. I found out how kind and concerned my new friends and colleagues are and that is so good to know. On October 20, I turned 70!!!!! Although I had pre-birthday anxiety and depression, the actual day turned out to be great! There was a birthday party during our break time. I provided cake, soda, juice and apples. 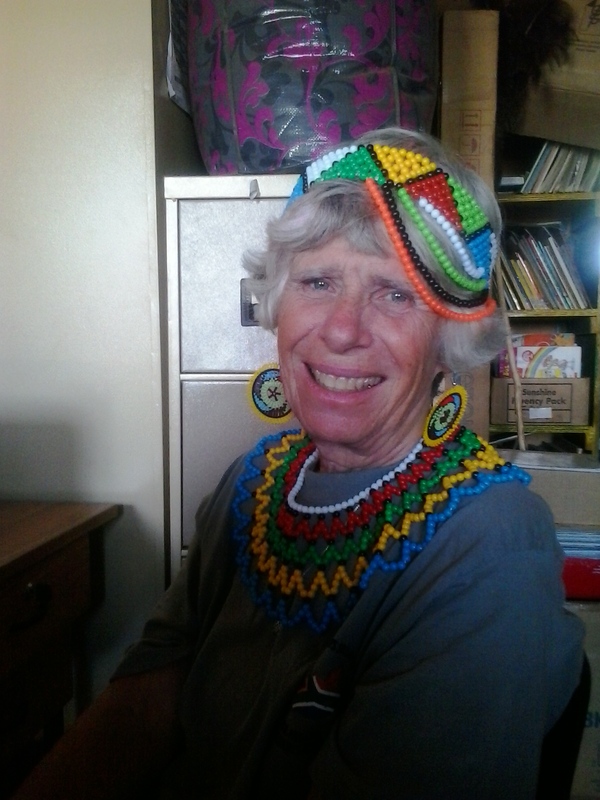 The staff wrote me a lovely heartfelt letter of appreciation and gave me a gift of some beaded Zulu jewelry. I gave a little impromptu thank you speech. I also invited six of my favorite colleagues to come to my house after school. I treated them with cut raw veggies and honey-mustard dip, cheese and crackers. This is very unusual fare in these parts! I gave each of them a thank you and appreciation letter plus a small gift. (I explained that one of my favorite books was Lord of the Rings and that Tolkien had created a whole world, including the race of hobbits. Hobbits give others gifts on their birthdays.). My new friends were so kind and loving and didn’t stay long. They had to get back to their full lives of husbands, children, families, cooking, washing, etc. I was mentally and emotionally exhausted by then. I felt deeply satisfied.